This product is now obsolete and has been replaced by the CEL-120 Acoustic Calibrator. The CEL-110 is designed and manufactured to comply with the requirements of the new IEC 60942 3rd edition 2003 Acoustic Calibrator standard. This latest standard ensures accurate calibration over a wide range of temperature, humidity and pressure conditions, typical of field work, making this calibrator an integral part of your measurement kit, not just an accessory. The field calibration of Sound Level Meters is an essential procedure when carrying out any type of noise survey. Calibration with an approved Acoustic Calibrator, both before and after each measurement sequence, ensures that meters are providing consistently accurate readings. This type of measurement accuracy is necessary for monitoring within noise exposure standards, including the Noise at Work regulations and environmental noise regulations such as BS4142, as well as many other acoustic tests. The CEL-110 unit is compact and ergonomically designed with simplicity and ease of use being the highest priorities. Key features include a simple keypad for logical control, and cursor keys permitting calibration level changes when required. The CEL-110 uses a high quality microphone and a feedback loop to maintain the acoustic pressure in the cavity at the required level. An additional ease-of-use design benefit, usually not found in acoustic calibrators, is the provision of a display. This liquid crystal screen gives concise information on calibration level, frequency and battery life. The design principles used result in an error message on the display if the microphone is not inserted correctly into the cavity, removing any potential for calibration error. The microprocessor controlling the CEL-110 detects when a microphone is removed from the unit and automatically switches off the calibration tone. This conserves battery power, allowing a standard battery to last for up to 3 years of operation. The calibrator is provided in 2 variants. The CEL-110/2 provides Class 2C performance and is suitable for measurements made in accordance with the Noise at Work regulations. The CEL-110/1 provides dual calibration levels (94dB and 114dB) to the Class 1 standard, which gives the additional accuracy required for environmental measurements and more specialist acoustic requirements. This is the most accurate class of calibrator defined by the standard for field measurement applications. Both the CEL-110/1 and CEL-110/2 calibrator accept all industry standard 1/2 inch microphone capsules. Smaller 1/4 inch microphones may be accommodated using the 1/2 inch to 1/4 inch adaptor (CEL-4726). The relevant CEL-110 also comes as standard with our range of noise monitoring kits. 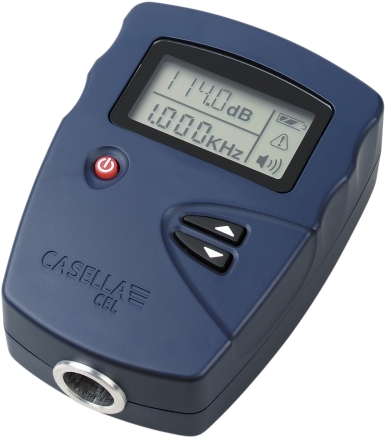 CEL-110/1 - Dual level (94dB and 114dB) Class 1 calibrator. Including battery and operating instructions. CEL-110/2 - 114dB Class 2C calibrator. Including battery, CEL-4726 adaptor and operating instructions.